“Do you realise this is a Chinese school?” the deeply-concerned head teacher told an American mother of two primary school-aged children after she handed in an application for her children to study at her local Chinese medium of instruction (CMI) government school last year. 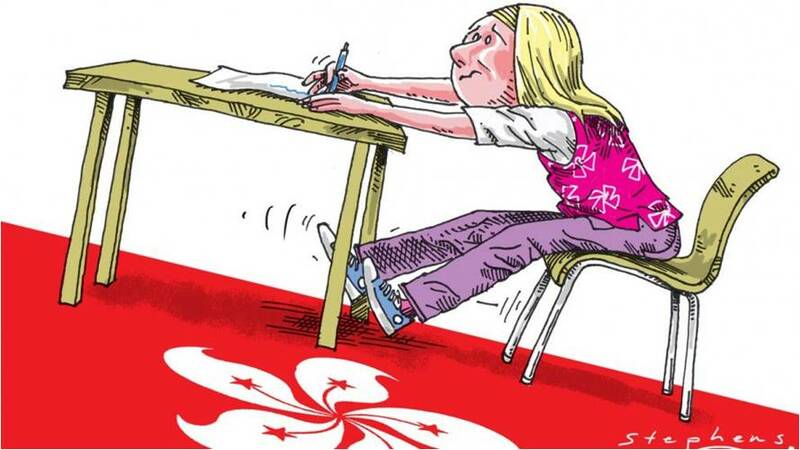 The mistake that she had apparently made was that, despite being near-fluent in spoken Cantonese and having lived in Hong Kong for 15 years working for a finance company, she was a visibly white expatriate hoping that her children would integrate into the local school system, be fluent in Cantonese, find employment in the region and, perhaps, even consider themselves to be “half-Chinese”, and Hong Kong to be their home. This mother is one of a growing number of parents who either grew up in Hong Kong or have settled here for work from the West, and seek to put their children through the local education system rather than the private English medium of instruction (EMI) international schools. The path would not be easy. Professor Paul O’Connor at Lingnan University and I have been interviewing Western expatriates about their experiences in the local school system with an interest in how they compare with the well-documented difficulties of South Asian minorities. Aside from having to persuade teachers at the better schools to admit their children, many of the parents we interviewed reported that their children experienced problems in the schools to which they were admitted. An architect from Italy, the mother of two daughters, told us that the teachers at her local Chinese primary school held little expectation that her eight-year-old would handle the language requirements. Consequently, her teacher put her daughter on separate tables with other English-speaking children and gave her less-rigorous assessments. Where do Eurasians belong in Hong Kong society? Our interviewees had to get used to a system of education that was totally different from what they were accustomed to, and one which they would have difficulty coping with. Aside from the vast amounts of memorisation required of students, one parent told us that his son was given 67 pieces of homework over a period of 18 days. Further, since assignment instructions are in Chinese, these parents cannot help their children with their assignments, let alone read school notices or attend Parent Teacher Association meetings, also exclusively conducted in Chinese. The story is, of course, all too familiar to Hong Kong’s working-class South Asian minorities who face the same problems, but do not necessarily have the means to send their children to private EMI schools or invest in the extra tuition required. “They’ll go to university in the UK, but not get a job in the region [if they return] because they can’t speak Chinese,” a freelance writer and father of two children told us. “They’ll have to go somewhere else, which is not their home.” Other parents were more idealistic about the prospect of their children moving outside the “bubble of privilege” they associated with international schools and mixing with local students. Aside from these problems, two-thirds of our interviewees were intimidated by the expensive school fees that international schools charge. Since the government has steadily reduced its subsidies to the English Schools Foundation (ESF) over the years, parents pursuing English-language education have to make up the shortfall. Tuition fees in these high schools now run way in excess of HK$100,000 (US$12,743) per year depending on the level, excluding non-refundable admission levies. While the salaries of Western expatriates are often above those of the local Chinese population, our interviewees did not enjoy the perks of housing, transport and educational allowances afforded to expats in the past. In fact, several expressed financial insecurity. Indeed, whereas the children of Western expats used to dominate ESF schools, in the academic year 2016-17, whites made up only 12 per cent of the ESF school population. The majority of students are now of Asian descent, typically those of wealthy Hong Kong residents returning from overseas or from the mainland who prefer an EMI Western-style education for their children. It is telling that none of our informants’ children ever made it to CMI secondary schools. In 2016, there were only some 55 recorded cases of white children attending Year 6 of primary school, according to a report compiled by Puja Kapai at the Centre for Comparative and Public Law at the University of Hong Kong. It would be tempting to add this story to a growing list of discrimination woes in which some “gweilos” claim to be victims. Yet this would be simplistic. It is the system that is clearly at fault. It is understandable that teachers at top CMI schools would be reluctant to accept children of mixed-language abilities when they increasingly have to compete with each other for funds on the basis of their students’ examination results rather than being rewarded for inclusion, and where there are inadequate public resources to ensure high academic achievement for all, regardless of nationality or language ability. There is also remarkably little help or encouragement for the children of non-English-speaking residents to integrate into the local education system, particularly in the early years. Meanwhile, the shortage of affordable international-style education – that could benefit all residents – serves only to preserve the privileges of a small wealthy minority, leaving the children of South Asian and Western migrants, who hope to fully integrate into Hong Kong society, stuck in lower-band schools that many Chinese parents avoid.